In the production areas of refineries, chemical plants, pharmaceutical facilities and semiconductor industries, there are a variety of hazardous and flammable gases and liquids that may be present in the manufacturing processes. To protect personnel and manufacturing facilities it is necessary to monitor these areas and processes for hazardous vapors. In addition to safety monitoring, regulations also restrict emissions of common solvents and reactants and require plants to continuously monitor and record compliance from areas in operations (e.g. 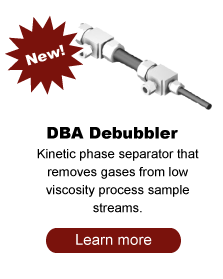 process vents, storage tanks, wastewater emissions and fugitive emissions from valves, pumps and other components). Most often the points to be monitored are remotely located from the analytical device, necessitating a method to transport and condition the sample prior to analysis. When sample transport is being considered there often times is more than one way to design the system. Clearly there must be a motive force to get the sample to the analyzer in a timely fashion. If the process or sample point does not have sufficient pressure then the sample must be ‘pumped’ to the monitoring system. Although a mechanical pump can be effectively utilized, this comes at the expense of decreased system reliability and high capital cost. For most applications an eductor is the better choice. Unlike a mechanical pump, an eductor is an inexpensive item to purchase, requires minimum expense to install, is an intrinsically safe device, and takes very little space in the sample system enclosure. And because there are no moving parts no maintenance is required. LEL monitoring or leak detection in areas that use or manufacture hydrogen and flammable solvents. Many of these require that the analyzer/monitor be located at a remote location for safety and maintenance reasons. The safe operation of manufacturing facilities is of utmost importance. Whenever flammable vapors build up in the atmosphere or in process equipment, a potential ignition or explosion can occur. Coating operations, manufacturing areas, ovens, dryers, furnaces and fume incinerators are a few of the areas of concern (See National Fire Protection Association (NFPA) for safety standards). To diminish the risks, monitoring devices are routinely used to assure the safe operation of facilities. In addition to assuring the safety of personnel and process equipment, using these devices can also lead to cost savings to the process by facilitating reduced ventilation, increased production rates, recycling of oven exhaust, reduced VOC destruction, improved burner efficiency, and fuel savings. In order to monitor the process or manufacturing area, the sample must be transported from the process or area, conditioned if necessary, and presented to the monitoring device. The most efficient and cost effective method of transporting the sample to the analyzer is by use of an eductor vacuum pump. With no moving parts it assures the reliability in a sampling system required for the safe and efficient operation of the process. Wherever toxic gases or volatile liquids are present, transported or stored there exists the potential for accidental leaks or spills into the surrounding area. Potential sources of emission can come from pumps, control valves, piping, manifolds, expansion joints, nozzles or sample points. Continuous monitoring of such hazards is an essential part of maintaining a safe work environment as well as minimizing product loss. Monitoring the area may require a gas detection system that can provide multiple channels of continuous detection for wide area sensing and maximum coverage. By using a manifold system multiple points can be sampled and transported simultaneously to be monitored. A single mini-eductor is capable of simultaneously drawing from multiple remote points. The capacity of the Motiv-Air-Torr will accommodate several sample points while assuring the required sample delay. This is a simple, reliable, and inexpensive method of accomplishing the measurements. 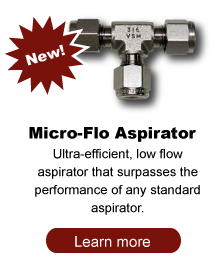 If single points of monitoring are involved, then the MicroFlo eductor would be the optimal choice. This device will deliver the sample from 200 ft within 60 seconds while using a minimal amount air. It is equally important in the safe operation of a plant to assure that those areas where nitrogen is used are monitored for oxygen depletion. This includes nitrogen compressor rooms, areas where process equipment is inerted by nitrogen, and process lines that carry nitrogen. These areas require monitoring for oxygen depletion for the safety of operations personnel. Much of this equipment also requires monitoring for oxygen content to assure that the process remains below concentrations that would support combustion or an explosion. It is best to install remote monitoring of these areas for the safety of instrument maintenance personnel as well as production personnel. Transporting the sample to a safe area for the analysis protects all personnel involved. 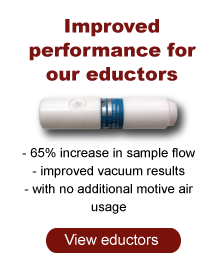 The mini-eductor vacuum pump reliably transports the sample at the least capital cost, at a minimum operating cost and requires no maintenance. Because waste product streams are collected from multiple sources to be flared, continuous monitoring of those streams is necessary to determine the BTU content and ensure proper combustion efficiency of the stack. This determines whether the collective stream can be burned as a standalone fuel source or whether it needs to be blended with another fuel source to meet EPA efficiency requirements. Proper control not only assures compliance but also optimizes use of added fuels, thereby minimizing costs. Because the pressures of the waste streams are generally low, the samples need to be pulled from the lines by a pumping mechanism. 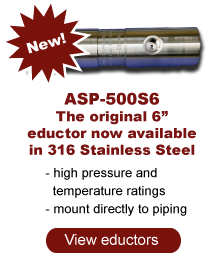 The mini-eductor is well suited for sampling low and negative pressure lines. This intrinsically safe device is a low cost option with minimum installation, operating and maintenance expense. Because these transport lines for the waste streams must be kept inerted for the safe operation of the plant, oxygen content must be maintained below specific thresholds. Monitoring these low pressure lines for oxygen content involves removing the sample from the lines, conditioning the stream to remove particulate, liquids or condensibles, and transporting the sample in a timely manner. The mini-eductor is commonly used for these applications. Monitoring of stacks requires that hot gas samples be drawn from the stack, conditioned and transported for the analysis. These samples are not only hot but are at negative pressure and contain corrosive gases. To draw the sample from the stack requires a ‘pump’ to move the sample to the analyzers. Mechanical pumps can be employed for the purpose, but introduce a degree of unreliability to the analysis system. Parts wear, diaphrams rupture, and failures happen with time. The pump must also meet electrical classification which can be an expensive proposition. Electrical devices also require conduit, wiring and circuits. Additionally, corrosives in stack gases necessitate the use of exotic metals, significantly increasing the cost of a mechanical pump. An eductor on the other hand transports the sample with no moving parts, requires no maintenance and is intrinsically safe. Only pressurized air (or other gas) is required. Our eductors are available in Teflon (also available in Ti, HC, monel, ss, …) for corrosive samples and are routinely used by several instrument manufacturers as an integral part of their CEMS systems. Most process analyzers in use today require some form of sampling system. That’s because all but a few analyses are done external to the process. The sample must be removed from the pipe or vessel, conditioned to meet the requirements of the analyzer, and transported within the required time frame. Process samples that are at low or negative pressure must be drawn to the analyzer, whether for process analysis, head space analysis or for safety monitoring. Use of an eductor is an efficient and inexpensive method to perform the task. Depending on regulations, samples might be vented or sent to a flare for destruction. For samples that must be returned to a point that has an elevated or backpressure, compensation for the backpressure can be made by increasing the pressure of the motive gas. See “Venting to backpressure” for details.